I’ve spent my free time this summer and early fall finishing the book dummy for my monograph, Precious Stranger, a very personal work, which I look forward to sharing with you soon. Now I will be able to return to my ongoing project, The Invisible Wall, which examines life and urban development east of the Anacostia River in Washington, DC. A selection from this project was recently acquired by the District of Columbia’s Art Bank Washingtoniana Collection. I will be speaking on this work during Fotoweek DC on Saturday November 12, 2017 from 2-3 pm at the Mexican Cultural Institute (Fotoweek Central). I’d be delighted if you are able to join then. Last month, I received news that I’ve been honored with an Artist Fellowship for the third year, by the DC Commission on Arts and Humanities. The fellowship is no-strings attached and recognized the individuals whose artistic achievement contributes to DC’s as a cultural capital city. I am grateful to be recognized with and provided support by my home community. I will be using the funds to assist the completion of the Precious Stranger. Riley Mariano and Layla Park, teenage girls of Tangier Island, pass time on a bridge that crosses the Big Gut Canal. Tangier Island was in the news this summer because despite ongoing erosion that threatens the future of the island’s residents, the mayor of the heavily pro-Trump island does not believe in climate change. I was pleased to visit the Chesapeake Bay island for Le Monde Magazine, where I spent a few days with Mayor Eskridge, accompanying him to “The Situation Room” where “all the world’s problems are resolved every afternoon,” according to the mayor. 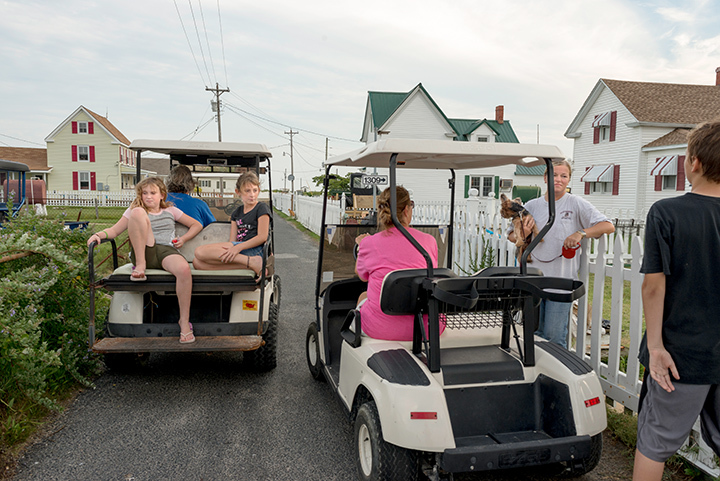 A deep sense of community informs the citizens of Tangier Island who often stop in the roadway to chat in afternoons after the days work on the water is done. Few cars are on the small island, but almost every house has a golf cart parked in front of it for easy transportation. Some of my favorite assignments are those that seem light-hearted, but reveal deeper issues. Such was the case when the call from Politico came to photograph “Cooter’s Last Stand, ” in Luray, Virginia. The event is a celebration of the famed 80’s television show, The Dukes of Hazard.” Drawing thousands from all over the world, the controversy involved the show’s glorification of the “General Lee,” a 1968 Dodge Charger with a Confederate flag emblazoned on its roof. 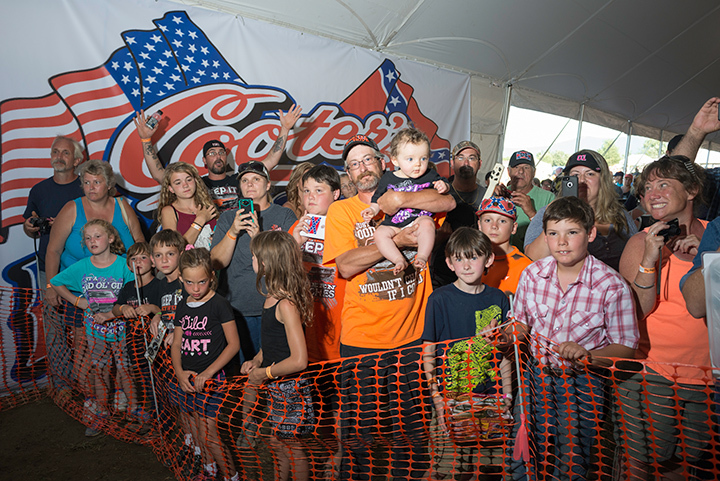 The crowd at the finale when the original cast of Dukes of Hazzard gathered onstage during “Cooter’s Last Stand,” an event that reunites the cast of the television show “The Dukes of Hazard,” which celebrates Southern pride and hosted by Ben Jones. Both opening next year, Southbound, developed by curators at the Halsey Institute for Contemporary Art in Charleston, SC, will feature 56 contemporary photographers’ vision of the new south. Not an Ostrich is the work of Museum of Fine Arts Houston Curator Emeritus Anne Wilkes Tucker, who spent weeks culling through the Library of Congress’ archive to assemble the photographs that will appear in this show. I wish you a happy and productive autumn and I hope our paths cross soon. Really love the colors on 2nd and 3rd photos.